It’s week four of the Style Perspectives where 14 bloggers each pick a look that defines their personal style. 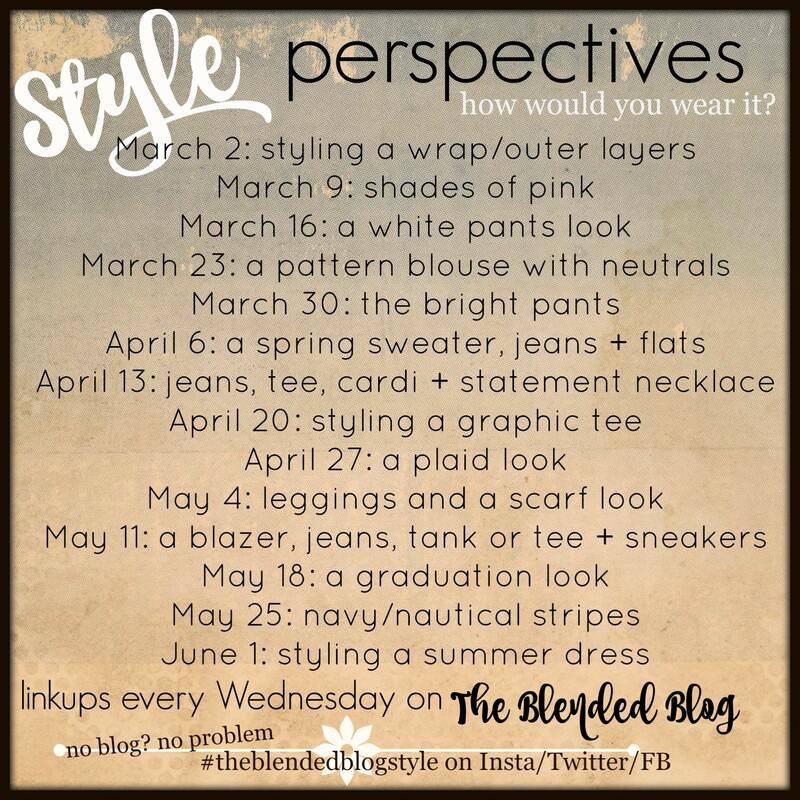 The featured blogger on the Blended Blog showcases her signature style (the prompt for that day) and then the other bloggers (on their personal blogs) show how they interpret it. Be sure to stop by the Blended Blog to see the featured lady. 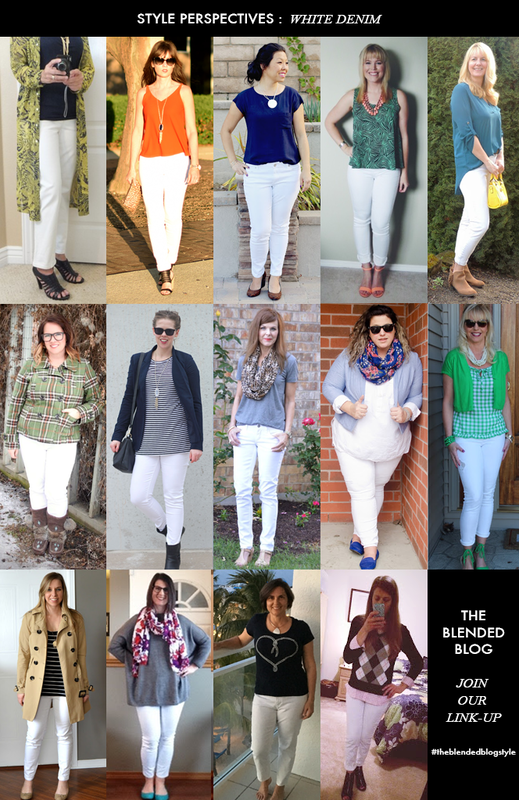 Did you see the white pants look last week? Here’s a quick recap. I love how each person expressed their individual personality and how different everyone looked. This week Abbie of Grumbling Grace is featuring a patterned blouse with neutrals. Check out her looks here. I took an inventory of my patterned tops and although I have floral, gingham and polka dots, the overwhelming amount of patterns is stripes. I love stripes!! I apparently do not love geometric or aztec because I have NONE of those. My neutral was denim (the ULTIMATE neutral, right?!!) but I added a pop of red in my shoes (gotta have a little fun!). 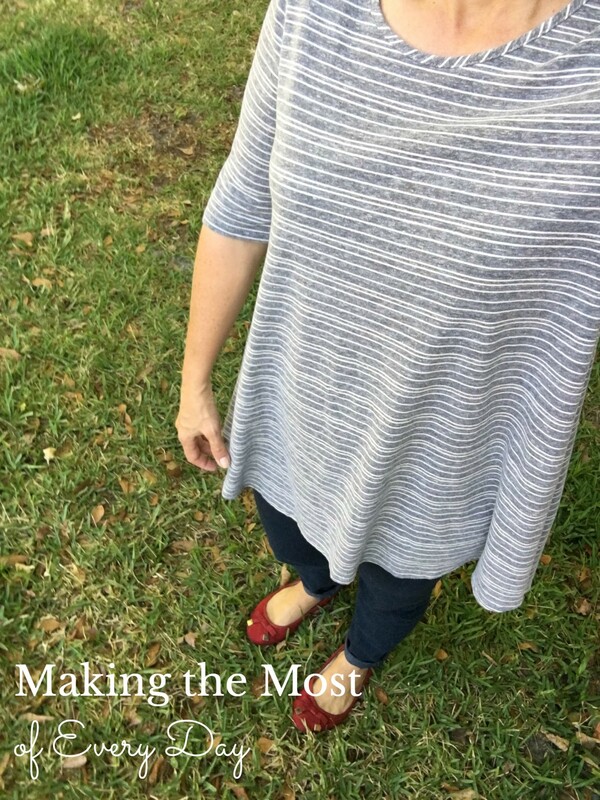 My first look is a long sleeved boat-neck Old Navy top. Although it’s spring here (oh the pollen!!) it was a little cool this morning and this top is perfect for the temps. I have another one just like it in red and cream. It’s a bit short however so on a day where I needed a little more coverage, this swing top would be perfect. It’s a little longer and very flowy and I would be able to reach my arms overhead to my heart’s content, without fear of exposing my belly! When the weather warms up a bit more, I have a short sleeved option. I actually have this same top in pink which I received as a hand-me-down. The blue Ralph Lauren tee was found at TJMaxx. So here are my three striped looks: long sleeved, medium sleeved, short sleeved. What is your favorite pattern to wear? Now go check out the other gals at the links below and post your pix on your favorite social media sites! I wanna see! 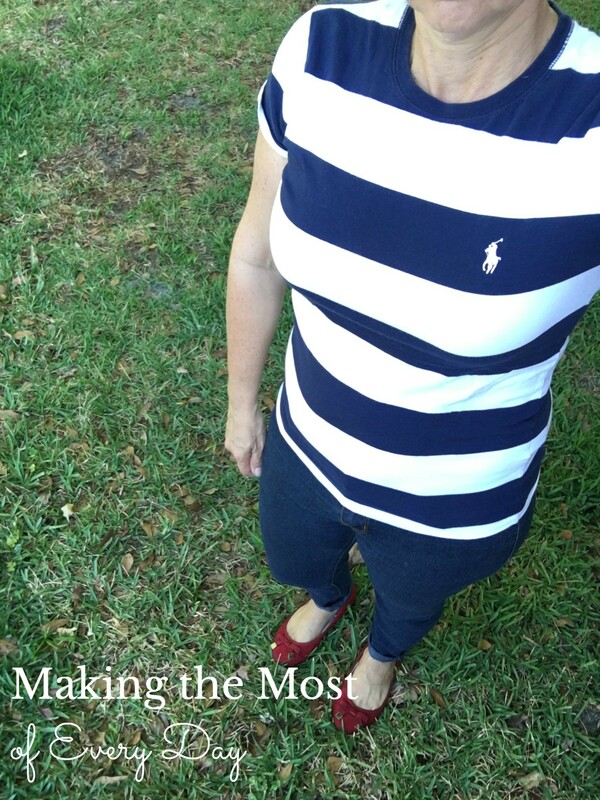 love you in stripes and I agree, you need the pop of color and red is perfect!! Yay for stripes and dots! You cute stripes Queen!! Love these, with the red pop in the shoes is my favorite! I love stripes, too! 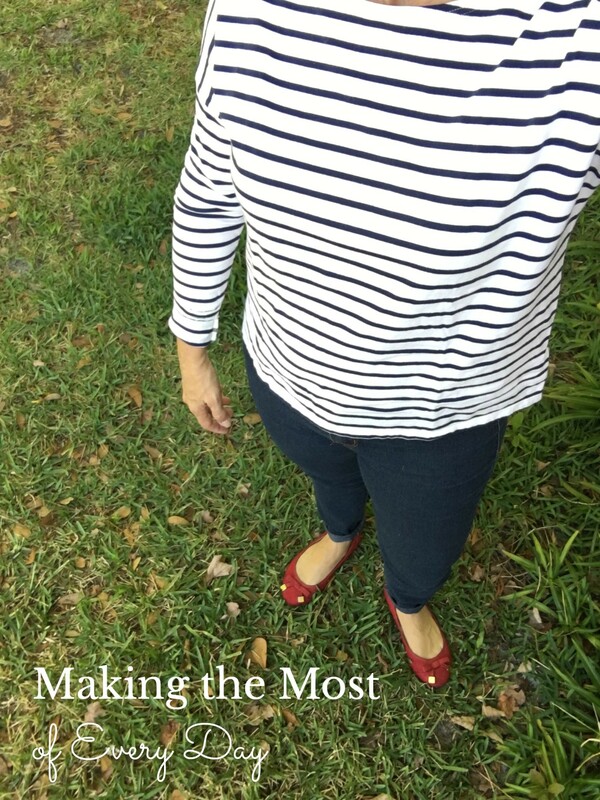 GREAT striped tops! Thank you! Just a sampling! Haha!! Because you had some great patterns! I’m a fan of stripes too. Love your red shoes! Thanks Lana!! Together with Sarah we can be stripes queens! You have some fun striped tops. I love the red shoes! Oh no about pollen – it will be hitting our area soon. Thankfully, I don’t suffer from allergies, but it gets everywhere! All great picks. My fave is the first one. Love the pop of color too! high fives for fun shoes to up the stripes look! Funny, but I do associate stripes with you and polka dots with Sarah C. And your new swing dresses are striped, if I am remembering correctly. You wear them well. I think I may have missed the boat…so what’s new…on the whole patterned thing. I took the word “patterned” to be interchangeable with print. Oh, well. You wear your stripes so well, my friend. Yeah, I think you’re right but I looked in my closet and only had one print top and I didn’t want to use it. So I had to use some poetic license. Yes, the dresses are striped too! Good memory! I’ll share a secret with you…I bought two more striped shirts yesterday!! Shhhh. Stripes might be my favorite pattern too! We can be stripes queens together!